Stressless Signature Series Base Reno Recliner with Ottoman- Fast Shipping Models Available at Unwind. It's always a great time to purchase a life-changing Stressless Reno Signature Series Recliner and Ottoman. Choose your favorite fabric type or leather grade, choose your favorite color and then leave the fast nationwide delivery to us. Why not add a useful accessory to your new Reno Recliner? Choose one of the following accessories: The useful Ellipse Table, the stylish Urban Table, or the fan-favorite Elevator Ring set. Standard pricing is automatically reflected when you make your leather/fabric selection from the colored swatches above. Need assistance- Please call 1-888-486-9463. Enjoy Fast & Safe Delivery on a Stressless Reno Signature Recliner with Ottoman. 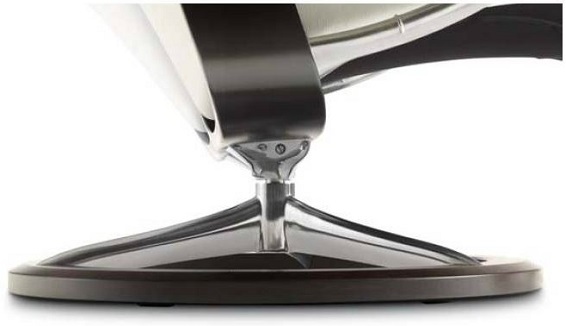 The Ellipse table will help transform your favorite Stressless chair, into your favorite place to relax. It is height-adjustable to perfectly sit next to your Reno recliner. It has a slightly raised edge to help prevent items from falling off. Holds your favorite drinks, books, remote controls conveniently to the side of your recliner, for easy reach. It will match your Stressless recliner wood stain just perfectly. Start relaxing in your beautiful new Reno Signature Recliner sooner with our Quick and Easy Shipping Methods. It's a great time of year to purchase from the amazingly comfortable, Stressless Reno Signature Series! This popular, modern recliner delivers exquisite head, neck and back support and the over-stuffed smooth, soft, cushioning allows you to sit undeterred for many hours on end. The Stressless Reno Signature recliner is among the most modern Stressless recliners available. Click here if you want to view the traditional Stressless Reno Recliner and Ottoman with the familiar wooden hourglass base. Ekornes is also introducing a new Full-Grain Leather called Noblesse. This is the absolute, most-exclusive leather grade offered by the manufacturer. It is through dyed so it will retain it's color for decades to come. During the tanning process, only the faintest touch of protective lacquer is applied to the leather's surface. This allows the natural softness and luster to glow without hindrance. Some might even say that Noblesse is softer than the former Royalin Grade Leather. The natural grain and texture have been retained the tanners do not correct the surface of the leather. This means that minor color nuances and skin blemishes may occur. This grade is the most delicate and therefore vulnerable to UV exposure and spills/stains. 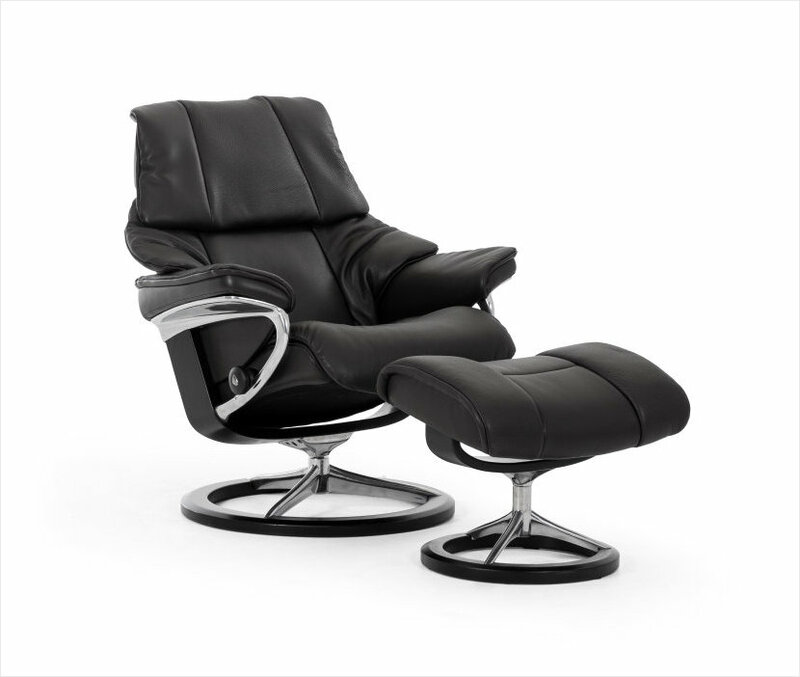 Choose your Stressless Reno Recliner with Signature Series Base and get Noblesse leather to top it off. The Stressless Reno Recliners match the Eldorado Series Sofas perfectly. They accent nicely with the Manhattan and Oslo Stationary Options as well. When you are seeking an "overstuffed" feel while still remaining in the Back-Healthy category, the Reno is your perfect choice. Check out our selection of Stressless Wave and Arion Sofas to find other beautiful furniture sets. Stressless Recliners by Ekornes of Norway are the only furniture line to be endorsed by the American Chiropractic Association. This is the largest Chiropractic Association in America. It is based in Virginia and serves as the national voice for the profession. The official announcement was made in 2002, but we wanted to remind you that when you choose a brand-new Stressless Signature Reno Recliner, you are not only choosing style. You are choosing a back-healthy seating system. 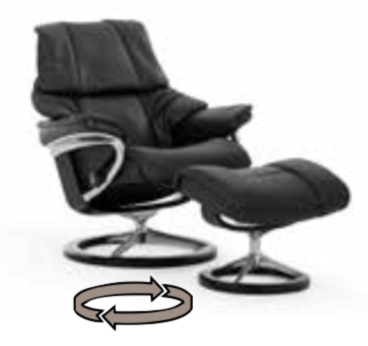 Plus System- allows the head rest of your new Ekornes Reno Signature Series Recliner to come forwards slightly as you recline in your seat. This allows you to easily carry on conversation, maintain eye contact with the television or enjoy a snack.